Eight interesting, smart and loud women sitting around a dining room table, enjoying a home cooked meal while discussing Lisa See’s Shanghai Girls. Some loved the book, most didn’t enjoy the ending and others just got bored after page 180…you know who you are! Nonetheless, everyone had a great time chatting about life, picking out new reading material for the next meetings and trying some new recipes inspired by the book. Welcome to Shanghai Girls and a Shanghai menu at my house! I hope this post inspires you to read the book and get a little adventurous in the kitchen with some delicious Asian cuisine. Lisa See’s Shanghai Girls is about two sisters, May and Pearl, who start the book in 1930’s Shanghai as glamorous middle class models. Their father marries them off to brothers they have never met in order to settle his debts and they end up as poor immigrants escaping to the United States. The story has its ups and downs, but overall it tells the fascinating story of hope, love, survival, and family. Shanghai Girls inspired me to make a menu of recipes I’d never tried before and I’m happy to say everything was a hit! 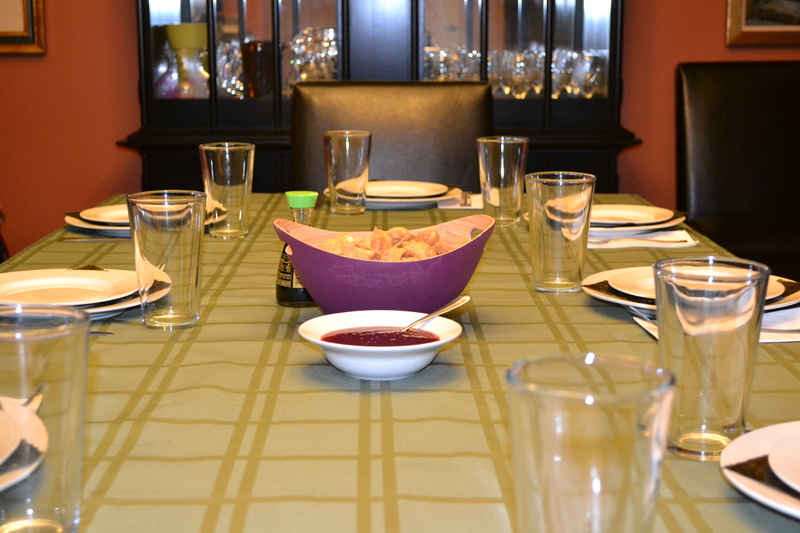 No leftovers to speak of, which is unfortunate since I love to repeat a tasty meal without the extra effort. These Chinese Dumplings are very popular during the Chinese New Year season and I thought they would be a great teaser for the meal ahead. A simple dough and a cup of water go a long way when forming these little pillows of ground meat. I began with the dough by stirring the salt in to the flour, then slowly adding the cold water until a smooth ball was formed. Don’t add more water than is necessary so you might not need to use it all. I kneaded the dough until smooth then covered and let it rest for at least 30 minutes. 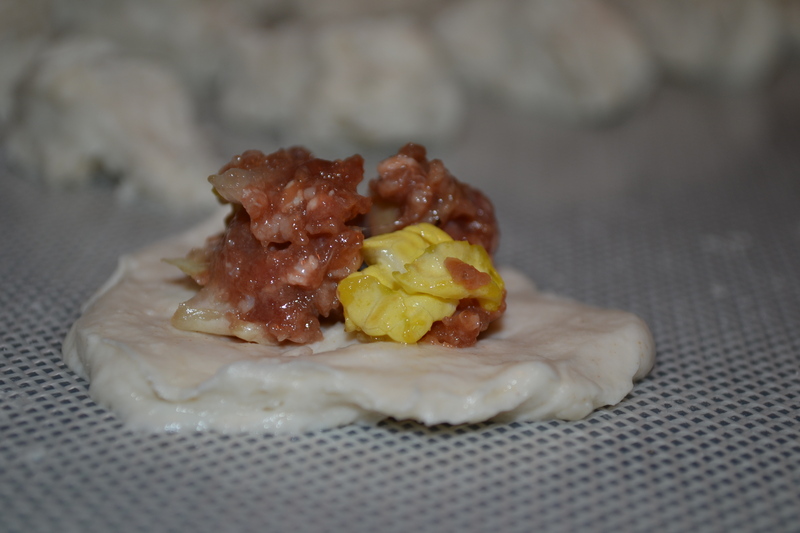 While the dough was resting, I mixed together the ground meat, soy sauce, salt, dry sherry and white pepper. I then added the remaining ingredients to the meat, mixed well and set aside. When the dough was ready, I kneaded it until formed into a smooth ball and divided in to 40 pieces. I flattened each piece into a circle about 4-5 inches in diameter. They don’t have to be perfect! If your dough is sticky, just dip your fingers in a cup of water to make handling the dough a bit easier. 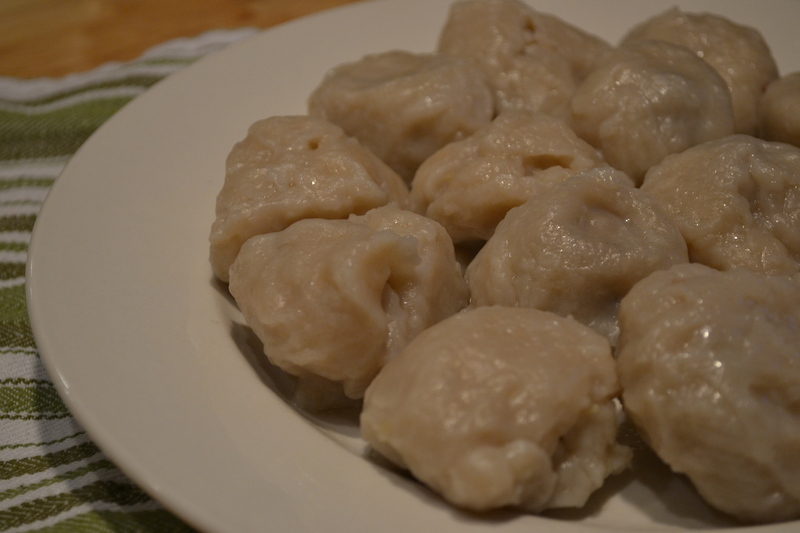 I placed a heaping teaspoon of the filling in the middle of each wrapper, wet the edges of the dumpling dough, folded over the edges and pinched to seal. 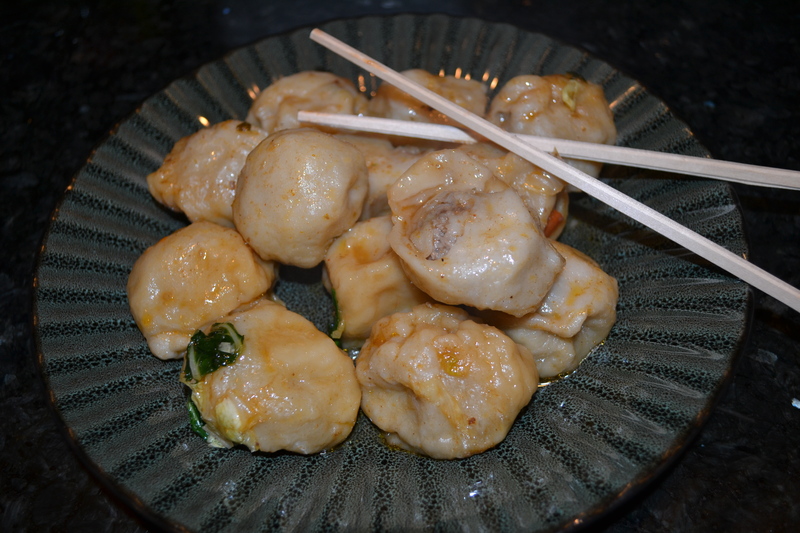 I made around 40 dumplings but some of them didn’t close properly so they were set aside. To cook the dumplings, I brought a large pot of water to a boil, added half of the dumplings and gave them a gentle stir so they wouldn’t stick together. When the water returned to a boil, I added 1/2 cup of cold water and covered the pot. When the water returned to a boil again, I followed the same process one more time and then the dumplings were ready. 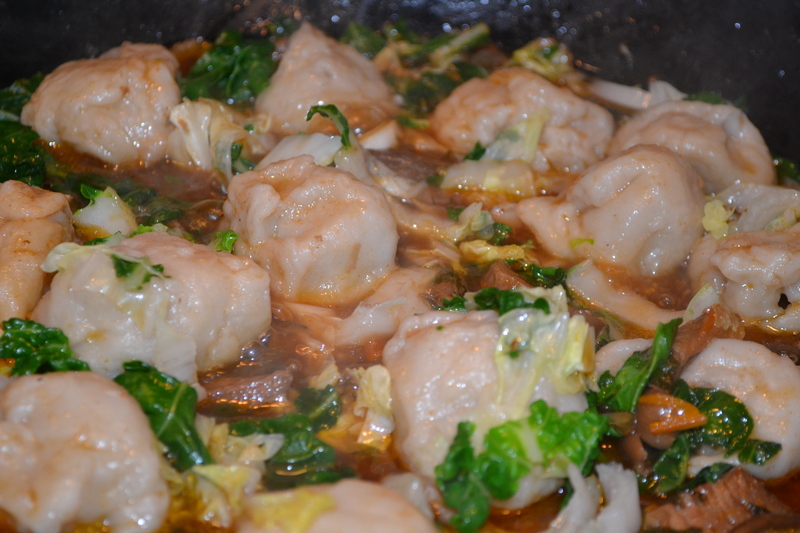 I drained and removed them from the hot water and followed the same process with the remaining dumplings. At this point, you can eat the dumplings plain, dip them in your favorite sauce, pan-fry, or place on top of the Red Cooked Beef (recipe will follow in a continued post) to combine the incredible Asian flavors. I have to thank my father for making this delicious salad for my book club dinner. 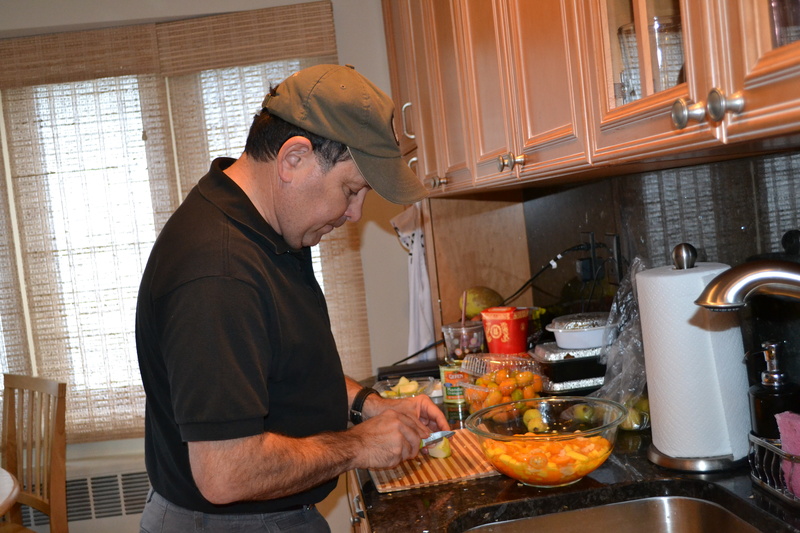 He had so much fun experimenting and mixing unusual sweet and tart flavors together. There are no measurements for this salad since you can use as much or as little as you want. Mix together: sliced kumquat, canned mandarin oranges with syrup, mango, baby guava, finely diced Fuji apple, 1 sliced vanilla bean, fresh or dried mint, and a sprinkle of sugar. Allow to set in fridge for at least 2 hours before serving. 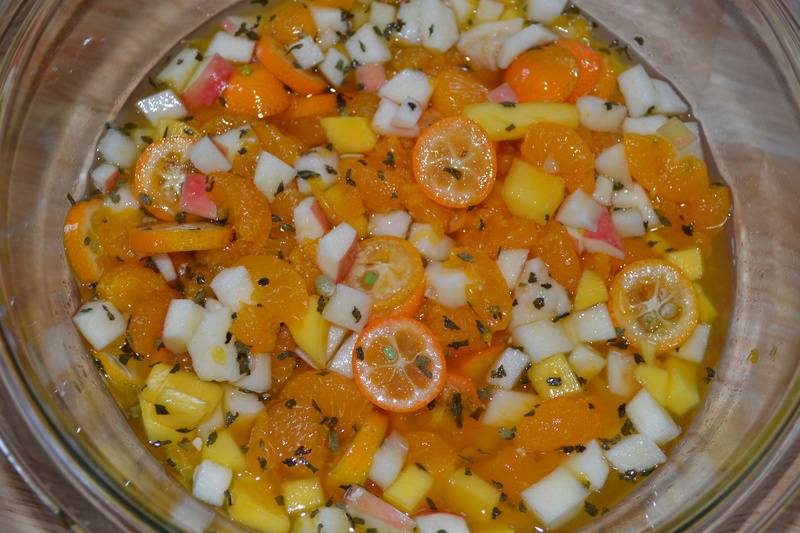 I suggest a spoonful of this incredibly sweet and tart citrus salad over a bowl of your favorite sorbet. Shanghai Girls and a Shanghai Menu: Part 2 will follow soon with main course recipes! Daddy made it into a post!